A timely convergence of factors led to the creation of a new “urban” national park in the Bay Area this month in 1972. The Golden Gate National Recreation Area, created under an act signed by President Richard Nixon on Oct. 27, 1972, is an amalgamation of sites in Marin, San Francisco and San Mateo counties that contain more than 82,000 acres. It is consistently one of the top two most visited recreation areas of the National Park Service, with more than 19 million visitors annually. 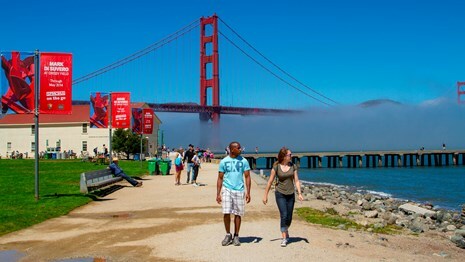 Its far-flung attractions include Muir Woods, the Marin Headlands and Stinson Beach in Marin County; the Presidio, Golden Gate Bridge plaza, Alcatraz Island, Chrissy Field, Ocean Beach, and the Cliff House and Sutro Baths in San Francisco. More recent additions include sites such as the Phleger Estate and open space areas in San Mateo. The catalyst was a growing desire to preserve open space and historic sites from growing development pressures in the Bay Area, including Alcatraz and the Marin Headlands. Some 60 activist groups enlisted the support of powerful San Francisco Congressman Phillip Burton on the effort. “As the chairman of the Subcommittee on National Parks, he battled boundary lines with the military, brazenly added more acreage of land to the bill than thought imaginable and pushed, and perhaps, bullied through the legislation that created the new urban park,” the GGNRA says in an online page dedicated to Burton.